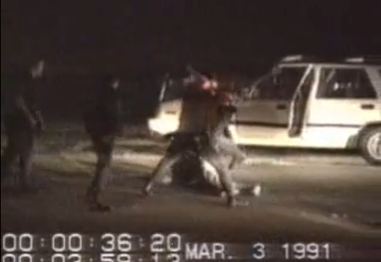 The Rodney King beating is among the most famous amateur videos ever recorded, existing in the same category as the Zapruder film. It was also one of the first times the public witnessed police brutality on video. When the verdict came down and the officers involved got off scot-free, the ensuing riot lasted six days, caused more than 50 deaths, set thousands of fires, and did millions of dollars in property damage. What went relatively unnoticed at the time was the fatal interdependence of social unrest, the institutionalized violence of law enforcement, and mass produced video recording and sharing technology. The subject of law enforcement is conspicuously absent from much of Foucault’s 1975 classic Discipline and Punish: The Birth of the Prison. He was primarily concerned with pursuing a genealogy which followed torture to modern disciplinary institutions such as prisons and schools. However, it is precisely the subject of police brutality where Foucault’s analysis is most useful today. While there are many observations pertinent to this subject they are scattered under different headings due to the alternate nature of his project. In this essay, I attempt to organize some of these into a coherent whole. But we can surely accept the general proposition that, in our societies, the systems of punishment are to be situated in a certain ‘political economy’ of the body […] it is always the body that is at issue – the body and its forces, their utility and their docility, their distribution and submission (25). If schools have become an essential disciplinary institution in the modern state, it is not a coincidence that they are failing the same portions of the population which are most commonly subject to violence at the hands of the police. These two phenomena are part of the same set of power relations. The heavy reliance on violent repression by police exists as a kind of supplement for the failing disciplinary institution of the school. When the sovereign power is unable or unwilling to maintain discipline in the population through schools, it regresses to the regime of violence and torture. All such phenomena are part of a greater political system and the school to prison pipeline is very real. And this superiority is not simply that of right, but that of the physical strength of the sovereign bearing down upon the body of his adversary and mastering it: by breaking the law, the offender has touched the very person of the prince; and it is the prince – or at least those to whom he has delegated his force – who seizes upon the body of the condemned man and displays it marked, beaten, broken. The ceremony of punishment, then, is an exercise of ‘terror’ (49). It is essential that the public understands the police have such methods at their disposal in order for them to function. When the threat of of deprivation of rights or money is not enough to create compliance, submission is obtained through the use of violence. Every citizen lives with the knowledge that such methods of violent coercion can be applied to him or her if a certain threshold of disobedience is breached. This threshold is wildly uneven depending on a wide range of factors, most notably race. No matter how unjust society is, obedience to it is demanded, ultimately upon penalty of death. This uneven application of violent coercion is merely an intensification of already existing power relations. It is also a means through which these relationships maintain themselves. Ultimately, police brutality is the purest expression of the unequal power dynamics in which the citizens of the United States find themselves. In one of the most memorable parts of the entire text, Foucault describes a riot which occurred during an execution in Avignon at the end of the 17th century (63-64). This description has much in common not only with the LA Riots, but all such episodes which follow an incident of police brutality. After a botched hanging, the crowd believed the condemned was being caused unacceptable amounts of pain and misery. As a result, the executioner was severely beaten and the gallows were smashed to pieces. It highlights two important points: incompetent execution as a source of outrage and the explosive potential of a crowd which witnesses it. We should consider the incidents of police brutality we witness on video today to be precisely that, inept executions, regardless of whether or not lethal force is employed. It is particularly when violence is employed in an incompetent or sloppy manner that the power of the state and potential for outrage are at their greatest. In these executions, which ought to show only the terrorizing power of the prince, there was a whole aspect of the carnival, in which rules were inverted, authority mocked: and criminals transformed into heroes (61). As a result, these public displays of brutality are something the state prefers to keep carefully hidden away. While the threat of this violence is very real, the understanding of it must remain abstract. Witnessing the sheer brutality of these methods fundamentally alters the understanding citizens have of their relationship to the sovereign. Such barbaric scenes, rather than inspiring fear, create contempt and resentment. Rather than illustrating the triumph of the sovereign, it serves to illustrate the undiluted oppression existing in the society the citizens inhabit. This raising of public consciousness has the ability to overturn the existing power relations within society. The amount of instability created is directly tied to the clarity and realistic appearance of the images and videos shown to the public. Video technology has drastically increased in the past several decades. Today, almost everyone in the US possesses a high quality video recording device in their smartphones. Rodney King was only the beginning. Video recording technology has brought an unprecedented level of quality to the images we perceive of police violence. Through the media and on video sharing sites like YouTube, the public is bombarded with audio and visuals too compelling to ignore. Advances in recording technology has changed the way law enforcement functions as well. Dashcams have become standard equipment in every police car. Modern law enforcement cannot be conceived of without them. Interestingly enough, this is part of the constant surveillance Foucault defined as a means of social control. The police themselves now live inside the Panopticon. This also has the unintended effect of putting the violence they deal out back into the public square. What was once a secret between officers, the victims, and the state is now witnessed by all on video. The call for body cams on all police officers, a reform demanded by many activists, is an extension of this trend. Consider the recent scandal over the dashcam recording of the Laquan McDonald shooting. The suppression of this video was so important to the city of Chicago, the commitment to keeping it out of the public eye so strong, that it was only released by a court order after denying multiple prior requests (Marin, Mosely). When it was, the nation witnessed McDonald being shot in the back 16 times as he walked away from the police. The ensuing scandal was so great it caused the resignation of the chief of police. The officer who fired the weapon was also charged with first degree murder. It cannot be emphasized enough that it was the release of the video footage which led to these actions. Such examples are legion. It is crucial that this is not blamed on individual officers while absolving the institution of the police department on the whole. Even in the short time since the Laquan McDonald video was made public, a similar video involving the shooting of another young black male, Ronald Johnson, by the Chicago PD has surfaced. In similar circumstances, Johnson is shot in the back as he is attempting to run away. With such alarming frequency, it is impossible to argue that such events are not a regular occurrence. It is only now, when plausible deniability can no longer be maintained that it has become unacceptable. Once again, video recordings are at the heart of this. By the time Freddie Grey saw paramedics in Baltimore on April 15th, 2015, his spine was 80% severed at the neck (Sherman, Kaltenbach, Cambell). Video footage exists of him being drug into the back of a police van with broken legs while crying out in pain. How could one argue this isn’t torture? Although such incidents seem bleak, they also have the potential to overturn the very power relations which they express. With each display of police violence to the public, it only becomes clearer the barbarism law enforcement must resort to in order to maintain a society as profoundly unequal as our own, then as much as now. Foucault, Michel. Discipline and Punish: The Birth of the Prison. Vintage Books. 1995. Print. Sherman, Natalie, Chris Kaltenbach, and Colin Campbell “Freddie Gray Dies a Week After Being Injured During Arrest” The Baltimore Sun, 19 April 2015. Web. 13 December 2015. Interesting piece. Note that the riots in olden times that resulted from the botched execution might indicate the existence of class solidarity. I suspect that such solidarity hardly exists today.